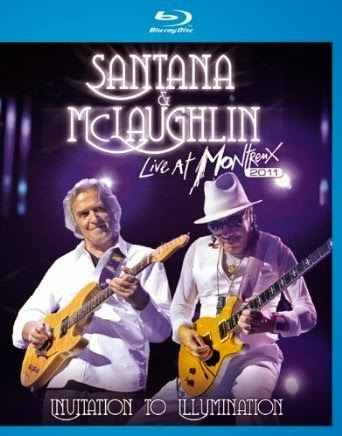 Jazz Station - Arnaldo DeSouteiro's Blog (Jazz, Bossa & Beyond): Blu-ray of the Month - "Santana & McLaughlin: Live at Montreux"
Blu-ray of the Month - "Santana & McLaughlin: Live at Montreux"
On July 1st, 2011, when Claude Nobs was still alive, the Montreux Jazz Festival hosted the reunion of two master guitarists: Carlos Santana and John McLaughlin presented their "Invitation To Illumination" concert, finally released now in 2013. Both musicians have been regulars at Montreux across the years but this was the first time they headlined their own concert together. The show featured most of the tracks from their landmark 1973 album for Columbia, "Love Devotion Surrender" (including John Coltrane's classics "Naima" and "A Love Supreme" plus "Let Us Go Into The House of Lord") mixed in with a wealth of other material like Pharoah Sanders/Leon Thomas' "The Creator Has A Master Plan" (from Sanders' 1969 gem "Karma" for Impulse!) The evening was a showcase of supreme musical virtuosity and spirituality and typified the approach of these two great artists.